Eggplant is delicious on the grill, and this recipe makes it even better with the use of a Thai-inspired marinade. Grilling is an age-old tradition in Thailand, with amazing marinade concoctions that make for taste-inspiring meals -- and this eggplant is no exception. Eggplant is a "meaty" vegetable; that is, it makes a great meat substitute and vegetarian Thai chefs love to use it in their cooking. You'll enjoy its sweet-spicy flavor -- makes a superb side dish to any meal you might be cooking. Happy grilling! Stir together the hoisin sauce, brown sugar, garlic, and chili. Slice up the eggplant into 1/4 inch-thick rounds and set in a bowl. Slather the marinade over and toss well to coat. Warm up your grill and brush with the oil. Set marinated eggplant over hot grill. When nice grill marks appear, flip them and brush tops with any leftover marinade. Keep grilling until eggplant is soft when pierced with a fork. Serve hot from the grill as is, or dress it up with a little fresh basil, either as a side dish or the star player (see tips below for how to make this into a complete vegetarian/vegan meal). Double the marinade (hoisin, brown sugar, garlic and chili) and add wedges of medium-firm to firm tofu sliced 1/4 inch. 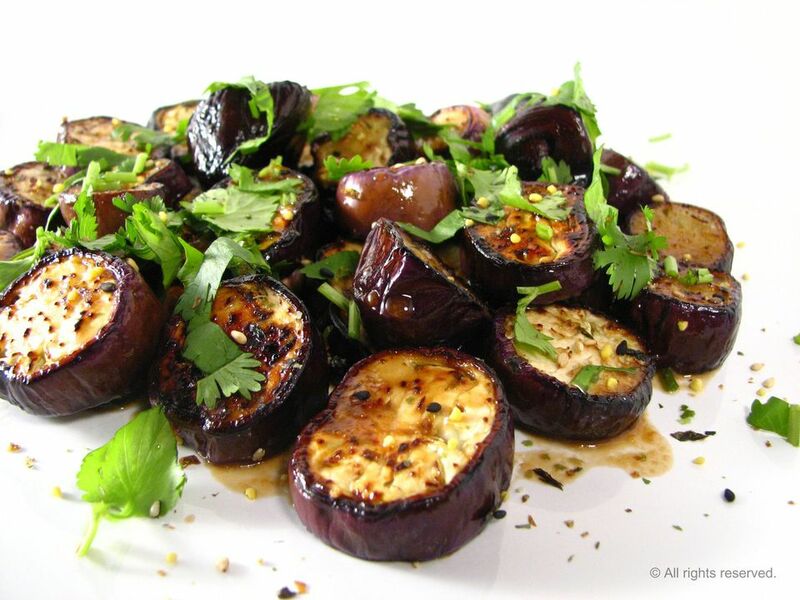 Toss eggplant and tofu together in the marinade. Allow a little longer time to marinate (20 minutes) or leave in the refrigerator to marinate longer, up to 1 hour. Grill and serve with Thai jasmine rice for a complete meal. Note that Thai sticky rice is also wonderful with this meal.